It was brought to my attention by a fellow blogger that I had failed to put together my top 10 posts of 2014. 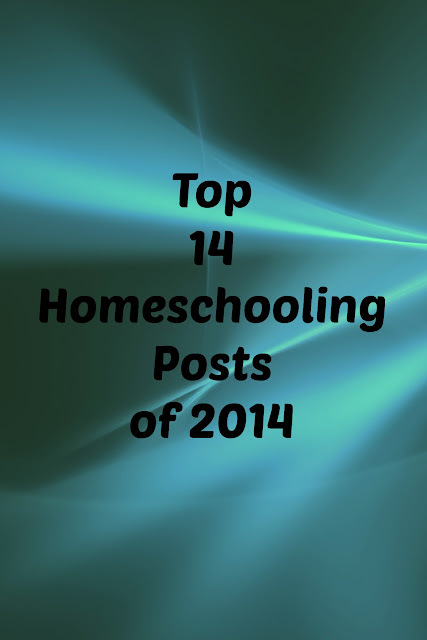 I decided to link up to my 14 most popular posts for 2014; the ones everyone has read and visited the most. 1. We're Baack! I wrote a post back in February about getting back into a routine after taking a week or so off to just play and enjoy ourselves. I didn't see this post as anything more than just a running commentary of our day like usual. I can only assume the recipe for snow dough is what brought so many hits. 2. Finding Balance This post was written around this time last year and it's all about my struggle to find a balance between schoolwork, house work, and "me" time. It's funny because we're struggling with this again! We lost our routine and I'm once again struggling to fit it all in and find a way to make it work. I guess I forgot I already had! Rereading this also reminded me that we need to write more Rebus stories. 3. A Day of Nothing Turned into a Day of Learning! This post was written as a commentary on how an unschooling day is in the life of our family. 4. Superhero Science-- A fun day of hands on learning where the boys had to brainstorm and try out different way to free their superhero characters from a block of ice. 5. Math Without Books-- This post was one giant brainstorm on ways to work on math skills with the boys without using traditional text books or worksheets. 6. Roll with the Punches-- another post about having a flexible enough school schedule to follow that also allows the boys to take the lead now and then. 7. There was a tie for 7th place-- Math on the Go, Messy Spelling, and Magical Rainbows and Lots of Learning Games-- Both of these posts dealt with lots of hands on learning games and craft projects. 8. Bang! And Other Fun Games for Learning-- I'm starting to see a real pattern here with the games for learning. Guess I'm not the only one who isn't a huge fan of workbooks! 9. Ugh! I'm just SO sick of This!! A post about our struggle to find that perfect line between unschooling/ delight directed learning and more traditional schoolwork and the importance of asking the kids for their input. 10. Finally a Field Trip-- Our trip to the Connecticut Children's Museum in West Hartford. 11. Why I Don't Ask Questions-- My views on reading comprehension and reading comprehension questions. 12. Another tie---More of A Traditional Day and Just a Typical Homeschooling Day. These two were just my typical posts where I outlined what we did throughout our typical day. 13. Yet ANOTHER tie!-- Hey, We're Delight Directed Learners! and The Camp that Never Was. We're delight directed learners looked a bit at the different types of homeschooling philosophies with a definite emphasis on delight directed learning. The Camp that Never Was was an outline of our struggle we had with my oldest son when he had real difficulty separating from me this past summer. 14. What Unschooling Means to Us Was a summary of a typical day where I sat back and let the boys take the lead with their schooling. They get some prompting and coaching from me but they pick all the activities and often show me how they learn best.